Kids already complaining about being bored? These 25 ideas for summer boredom boxes with keep them entertained with things you already have on hand. It's here, I thought I had more time but before I knew it summer was here. And it has brought with it the constant refrain of “Mom there's nothing to do!” You know other than TV, iPad, iPod, a stack of board games, sports equipment, bikes, swings, a sandbox, action figures, Lego's, and a ton other things lying around. Just a few days into the summer they are already bored. But you know what they really want, all they are looking for is a little direction and all their old things can become new and interesting- keeping them busy for hours. I have seen busy bags for toddlers and thought why couldn't something similar be done for older kids too? I headed down to Dollar Tree and bought 10 boxes and a pack of 3×5 cards – that's all the money I spent, everything else was items from around the house. That said you may want to pick up a few things at Dollar Tree for some of the ideas. My main idea was to create individual activities in each of the summer boredom boxes using toys, craft supplies, and other items. I sat down and brainstormed as many ideas as I could at first. 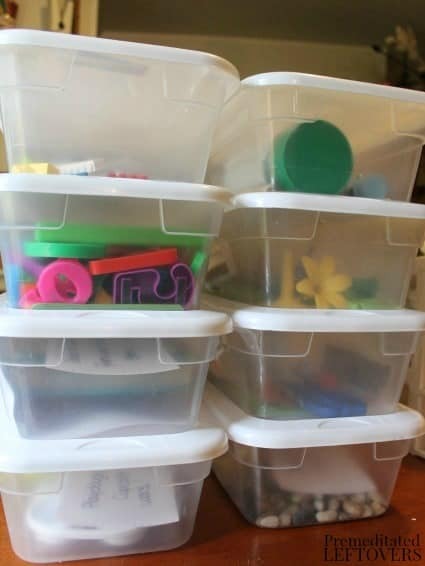 I wanted the summer boredom boxes to include a range of ideas for creativity, fine motor development, math, and reading, spiritual training, sensory play, and even outdoor exploration. I spread out my boxes – pulled items from the kids' rooms, my homeschool/craft stash, and loaded them up assembly line fashion. I wrote down a simple direction for each box to give them some direction, even a bit of challenge. Some I just packed for free play and let the kids' creativity take over. These ideas can be tweaked and implemented for toddlers to upper elementary aged children. 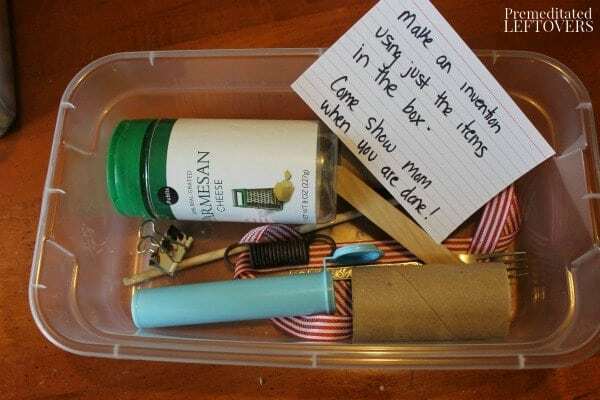 These summer boredom boxes can be used and swapped out daily for times when they just need a little extra help coming up with entertainment. It only took about 20 minutes to grab items, fill, and write up challenge cards for my 10 boxes. (the brainstorming beforehand took a while). 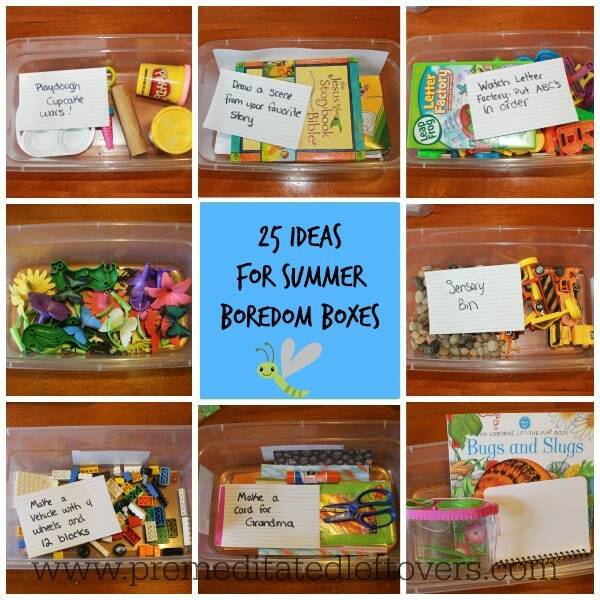 Here are the 25 ideas for summer boredom boxes I came up with. Feed the Birds – A pinecone, peanut butter, bird seed, and string. Stay busy while helping out your fine feathered backyard friends with a snack station. 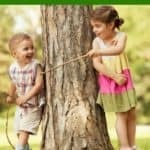 Help your child cover the pinecone in peanut butter, roll in the birdseed, tie on the string and choose a tree! 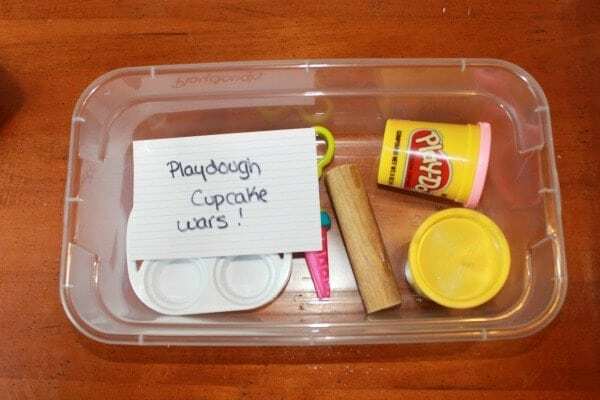 Playdough Cupcake Wars – A couple containers of playdough, some tools, and our mini cupcake tin. Toss in beads or sequins for sprinkles. Have your child make their best cupcake creation, better yet sit down with them and battle it out. Bike Decorating – Include streamers, tape, and balloons. Make a card explaining that you want your child to decorate their bike for a bike ride with you later. 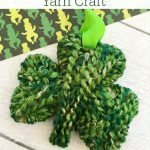 Artsy Fartsy – Fill a box with pipe cleaners, pompoms, craft sticks, markers, paper, tape, glue, scissors, or any craft supplies you desire. Let your child go crazy coming up with an art project. You can make it more specific and ask them to create a mask, hat, or another fun art piece. 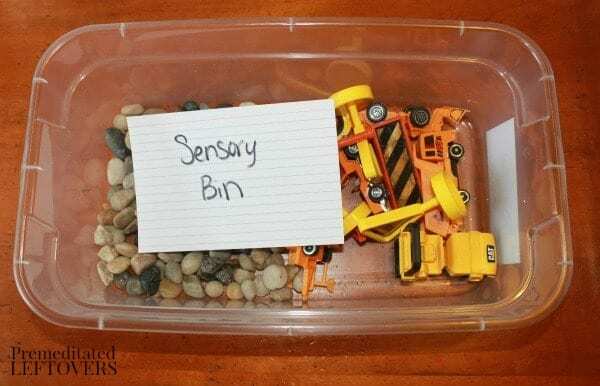 Construction Sensory Bin – Toy construction trucks and half a bag of pebbles from Dollar Tree create a fun free-play mini sensory bin. 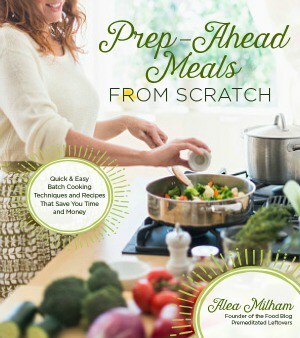 Now We're Cookin' – Include non-perishable ingredients, an apron, and a simple recipe. Work next to your child to create a yummy snack or dessert for you both to enjoy. Princess Games – Gather tiaras, jewelry, and high heels into the box. Dress up and try to complete tasks as a princess – walking, sitting, dancing, and even having tea. 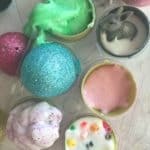 Fizzing Fun – Put vinegar, baking soda, food coloring, eye or medicine dropper in a box. If you haven't done this activity with your kids yet, this one will keep them busy for a while. Add a few drops of food coloring to a dish of vinegar, and use an eye dropper to transfer it to baking soda spread out in the bottom of the box. Sit back and watch the fizz! Chores for Cash – Write a chore and dollar value for it on each card. These should be extra jobs beyond what your child is normally expected to do. Clean the garage, vacuum, gather all small wastebaskets, etc. Give your child clear instructions or even a demonstration of how to complete the chore. Pay up for a job well done. 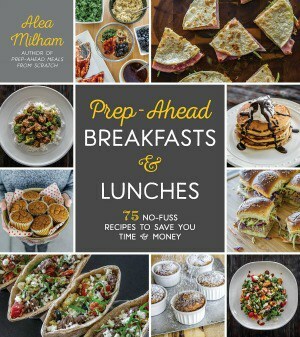 This is a win-win for you both – the kids can earn money while you get help around the house. Invention Box – If you have any, this box can put your hoarder tendencies to good use. Fill a box with springs, toilet paper rolls, wooden craft sticks, strings, paper clips, tape, empty plastic containers, and a small stapler. 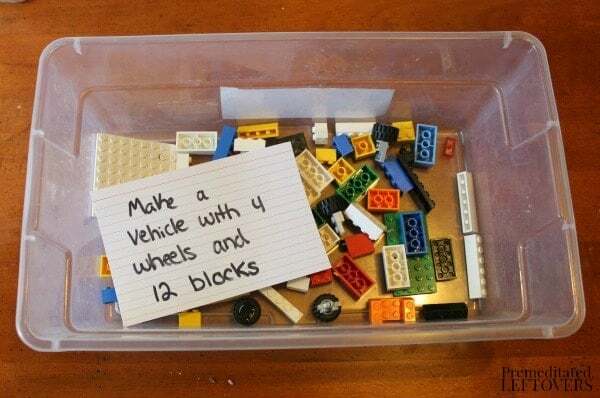 Challenge your child to create a new invention from just the items in the box. Flower Arranging – Floral foam, silk flowers, ribbons, and tissue paper are a great fill for this box. This is a fun mini dramatic play setup that will have your little one playing Florist for half a day. Record Breaker – Place a stopwatch in the box, along with a blank card and pen or pencil. Challenge your child to time themselves doing various things, such as running around the house and jump roping. Then set a goal to beat their record, and write down the results. Mr. Postman – Add paper, pencils, envelopes, and stickers. 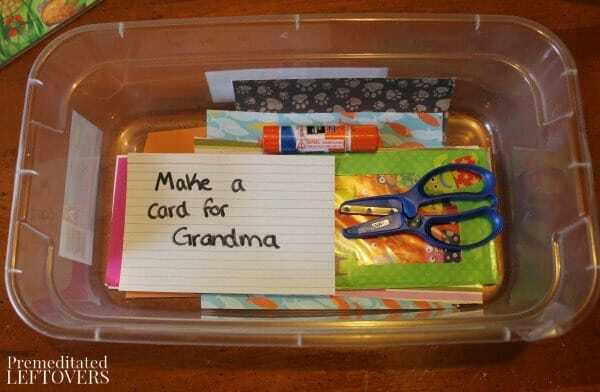 Make a card for grandma, write a letter to aunty Louise or their best friend. Be sure to have a stamp on hand so they can mail their card or letter. Illustrator – Pop in a favorite book, paper, and crayons or watercolor paints. Challenge them to recreate their favorite picture in the book. Bug Collector – Use a bug collection kit you already have on hand or pick up a new one at Dollar Tree. Include a blank notebook for taking notes and drawing bugs they see. A magnifying glass, tweezers, and a book about bugs will finish off this box for budding entomologists. Outdoor Fun – Add new items like sidewalk chalk, a jump rope, bubbles, water balloons or guns, and small sand toys. They will be excited to run outside and get to using them. Homeless Handout– I have an amazing friend who fills gallon bags with non-perishable foods like applesauce, crackers, bottled water and personal hygiene items like soap, deodorant, and razors to pass out to the homeless people she encounters. Get your child to race around the house collecting new items to fill the box, take it to a local homeless shelter, or pass out to homeless people you see. Giving to others is a great way to avoid boredom. More than a Movie – Place a movie in the box with some items to go along with it. 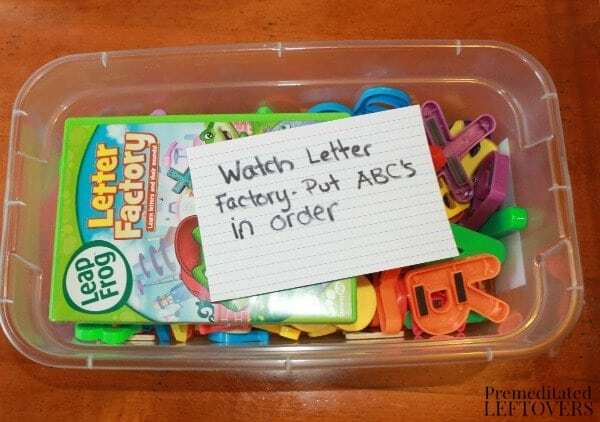 For my 3 and 6-year-old, it was a leapfrog video and a magnetic alphabet with a challenge to place the letters in order as they watched. The little one learns as big brother demonstrates how to place the letters. Li'l Gardener -Mini pots, a bag of soil, and a seed packet or two and you have a great seed starting kit for your kids to work with. Sunflowers, cucumbers, or zinnias are all easy to grow. Matchy Matchy – Place a card of a certain color or shape in the box. 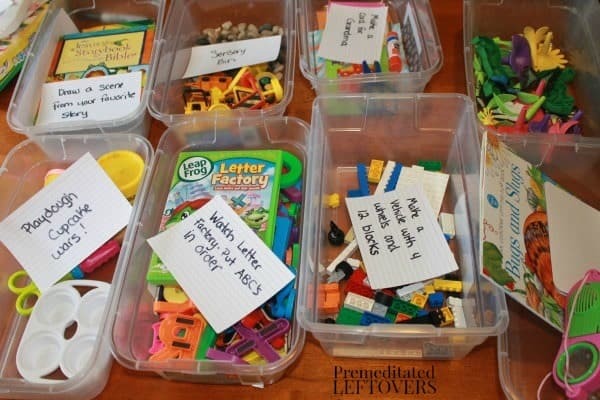 Have your child go on a hunt through the home filling up the box with items with the same attribute. Sneak in a little learning with their fun. Collage – I don't know about you but my kids love cutting stuff up! Place a sheet of paper, glue, a couple old magazines, and scissors in the box. On your 3×5 card instruct them to create a collage of pictures. Chose a theme like sports, happy people, my favorite foods, etc. Roadwork Ahead! – Add a roll of painters tape and a half-dozen hot wheels. Let your child create a parking lot and roads from the painter's tape. Its low tack will not hurt your floors and then they can drive the cars throughout their “neighborhood”. Just peel up the tape and throw it away when done. Sock Fight – Give your child and yourself a box full of rolled up socks, instruct them to duck and run for cover because its every man for himself and let the ammo fly! The boxes stack nicely for storing and using throughout the week. Popular ideas can and should make a come back later in the summer. What else can you think of to fill these summer boredom boxes with? Mine both loved quiet time boxes when they were younger. Summer is the perfect time to bring that idea back! Can’t wait to think up a few boxes of our own!